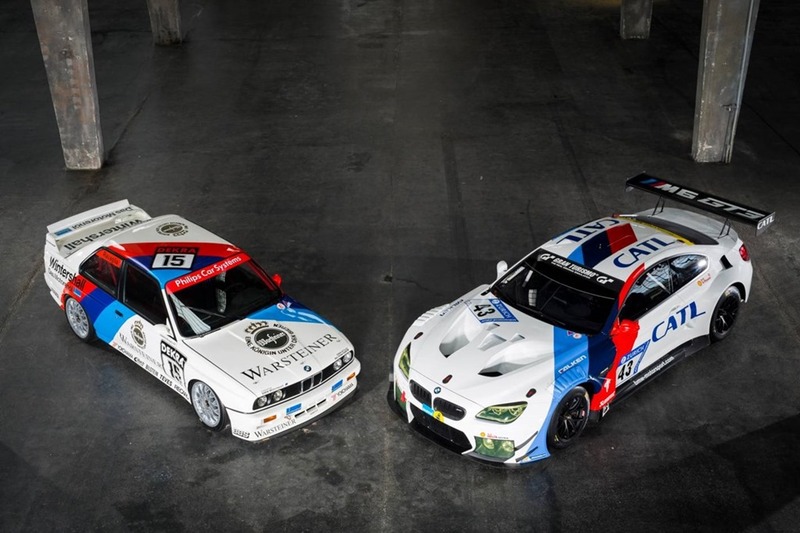 Throw-back to maiden Nordschleife victory: Historic livery for BMW Team Schnitzer BMW M6 GT3. BMW M6 GT3 sports special design at 24-hour race and 24-hour qualifying race. Striped livery in BMW Motorsport colours evokes memories of the victorious BMW M3 E30 from 1989. Farfus, Félix da Costa, Scheider and Lynn to drive the number 43 BMW M6 GT3. Munich. BMW Team Schnitzer can look back on an impressive history at the Nürburgring 24 Hours (GER). Team principal Charly Lamm’s (GER) crew has won the endurance classic in the Eifel Mountains five times in the past. To mark the team’s return to the “Green Hell” this season, the number 43 BMW M6 GT3 will sport a special, historic design. BMW Team Schnitzer wrote the first chapter of its glorious history at the Nürburgring 24 Hours back in 1989. The team from Freilassing (GER) claimed its first overall victory at the endurance classic on the Nordschleife in the same year as it won its maiden DTM title. After 143 laps of racing, eventual DTM champion Roberto Ravaglia, Emanuele Pirro (both ITA) and Fabien Giroix (FRA) crossed the finish line first in the iconic BMW M3 E30. In memory of this success BMW Team Schnitzer will return to the Eifel track in 2017 with one of the two BMW M6 GT3s sporting the same historic design as the winning car from 1989. Just two years later, BMW Team Schnitzer added a second success. In 1991, Armin Hahne, Joachim Winkelhock (both GER) and Kris Nissen (DEN) were victorious – again at the wheel of the BMW M3 E30, which took overall victory in the four consecutive years from 1989 to 1992. The car remains by far the most successful touring car ever fielded by BMW Motorsport. It made its DTM debut in 1987 and propelled Eric van de Poele (BEL) to the title at the first attempt. Ravaglia was also crowned world touring car champion with the BMW M3 E30 in the same year. In total, the car has 41 DTM race wins to its name. BMW Team Schnitzer claimed overall victory at the Nürburgring 24 Hours on a further three occasions: in 2004 and 2005 with the BMW M3 GTR and most recently with the BMW M3 GT2 in 2010. In 2017, the team lines up with two BMW M6 GT3s and top-class drivers. Reigning DTM champion Marco Wittmann (GER) will be joined by fellow DTM drivers Augusto Farfus (BRA) and Tom Blomqvist (GBR). Also in action will be BMW works drivers Martin Tomczyk (GER) and António Félix da Costa (POR), as well as two newcomers to the BMW fold, Timo Scheider (GER) and Alex Lynn (GBR). Farfus, Félix da Costa, Scheider and Lynn will share the driving duties in the car with the historic livery. Fans will get their first glimpse of this very special BMW M6 GT3 in action this weekend, at the qualifying race for the Nürburgring 24 Hours. The 45th staging of the classic endurance race will take place on 27th and 28th May 2017.